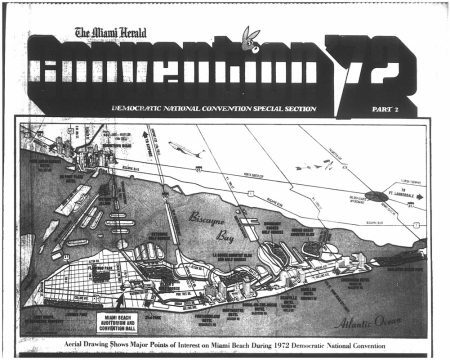 In the summer of 1972, Miami Beach hosted the Democratic and Republican national conventions, the last time one city hosted both conventions. 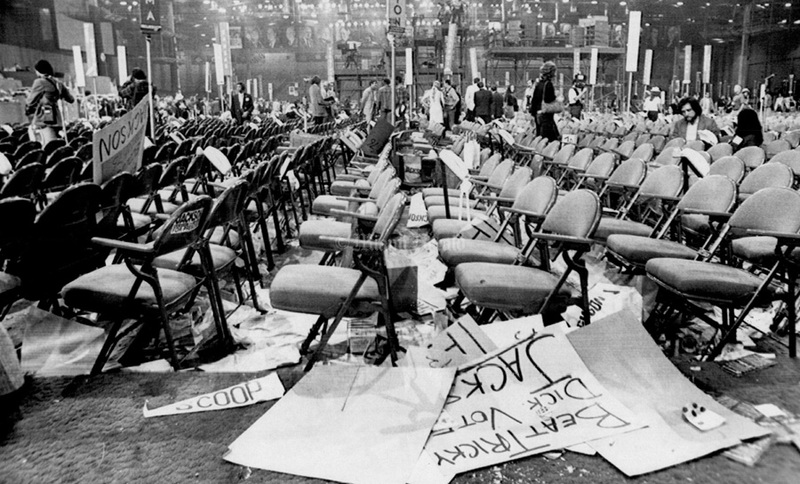 During the four-day Democratic Convention in July, only two people were arrested and two others injured. 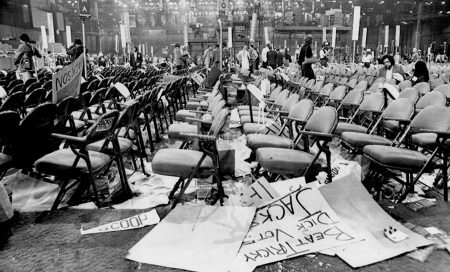 Four years earlier in Chicago, 680 people were arrested and 1,381 were injured. 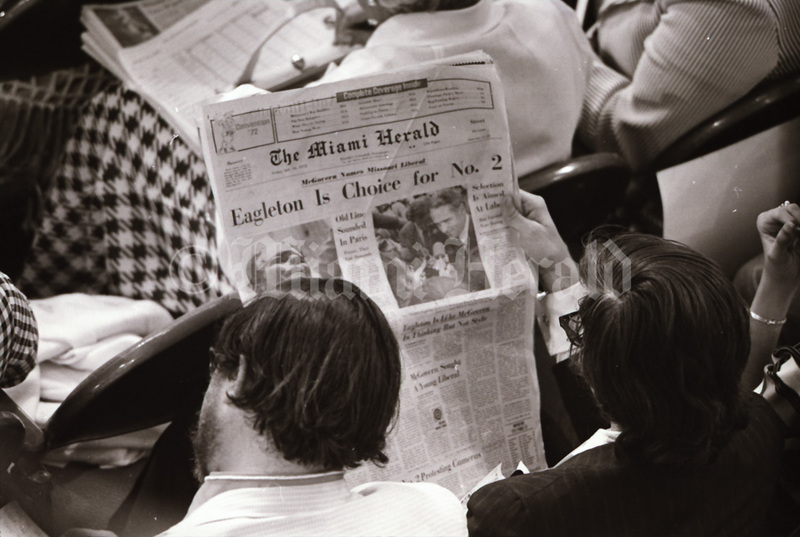 Rocky Pomerance, the Miami Beach Police Chief, received kudos from Walter Cronkite on down. The Democrats brought a lot of celebrity firepower with them to Florida, with Gloria Steinem, Shirley MacLaine and Henry Fonda making appearances. 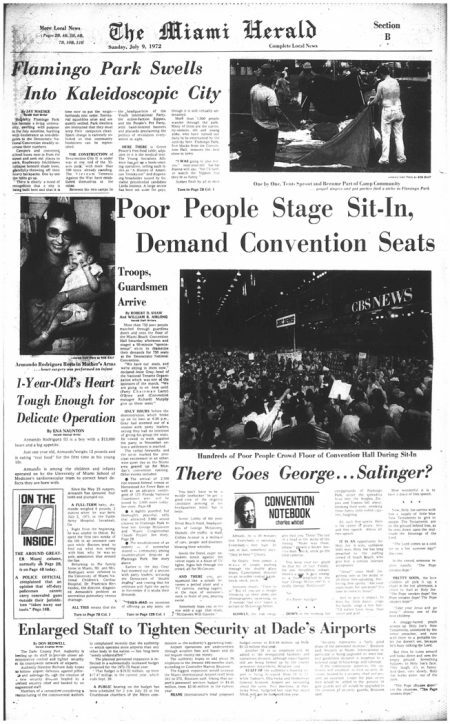 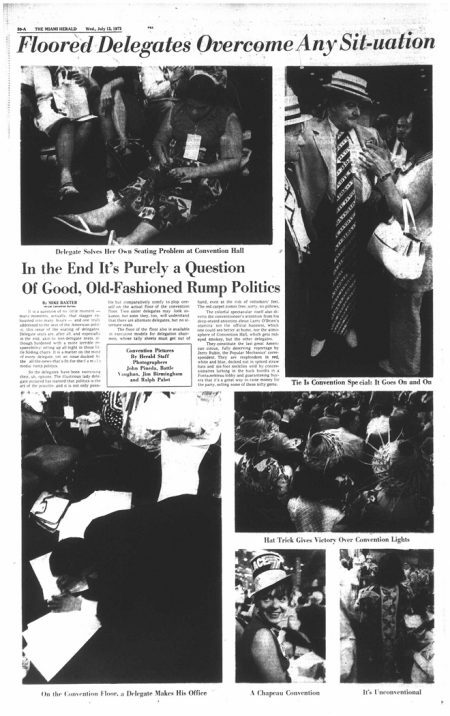 Although the mood outside the convention center remained relatively peaceful, the party suffered from internal turmoil that led to Senator George McGovern’s acceptance speech being delayed until almost 3 a.m. McGovern, a preacher’s son who promised to end the war, arrived in Miami Beach just short of the delegate vote count needed to win the nomination. Sen. Hubert Humphrey, Gov. George Wallace, and Sen. Edmund Muskie each held out hope that he could deny McGovern a first-ballot victory and win the nomination. 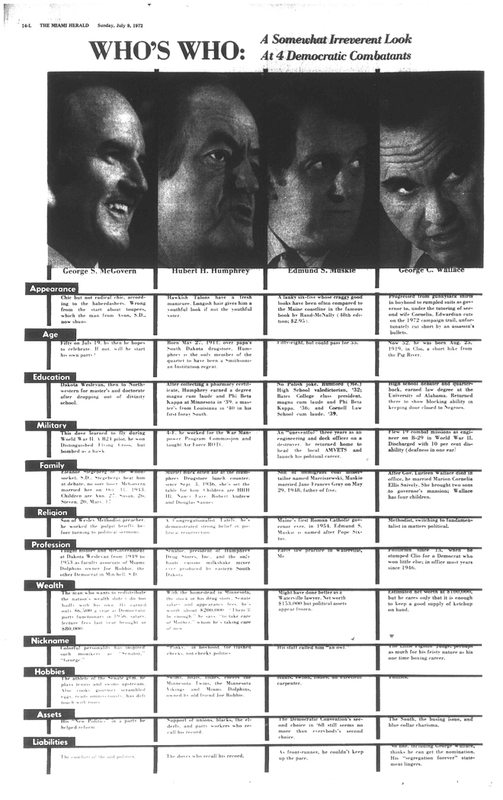 But with his 34-year-old campaign manager, Gary Hart, managing the action, McGovern won a floor fight the first day to claim the necessary delegates. 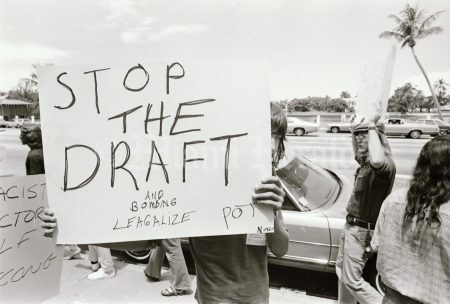 7/1972, Miami Herald Collection, HistoryMiami Museum: Protests outside of the Democratic convention. 7/8/1972: Waiting For The Calls--Waiting for calls from the television viewers for donations to the Democratic National Committee to raise funds for the party are early arrival personalities. 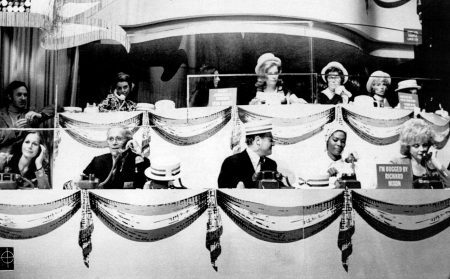 Left to right, Gene Hackman, standing, Sally Kellerman, Henry Fonda, E. G. Marshall, Dionne Warwick and Edie Adams. Top row not identified. 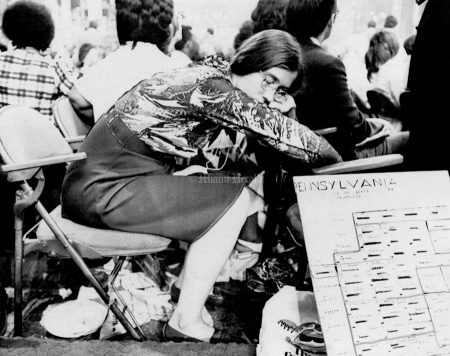 The Democratic National Committee has enlisted more than 100 entertainment and sports personalities to raise funds in an 18½-hour telethon which started tonight. 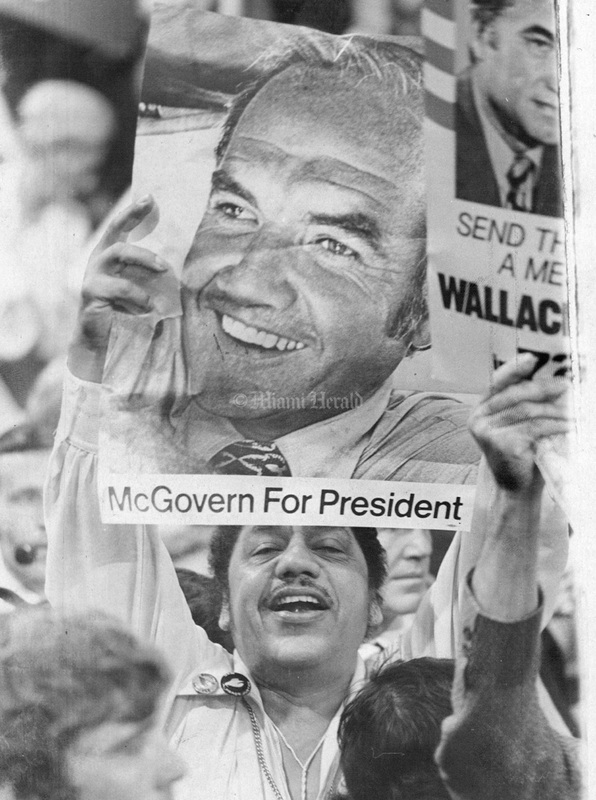 7/13/1972: California Cheer McGovern Nomination--Members of California's 271-strong delegation, led by actress Shirley MacLaine, right join in the demonstration at the Democratic National Convention as Sen. George S. McGovern was nominated Wednesday night to be the party's presidential candidate. 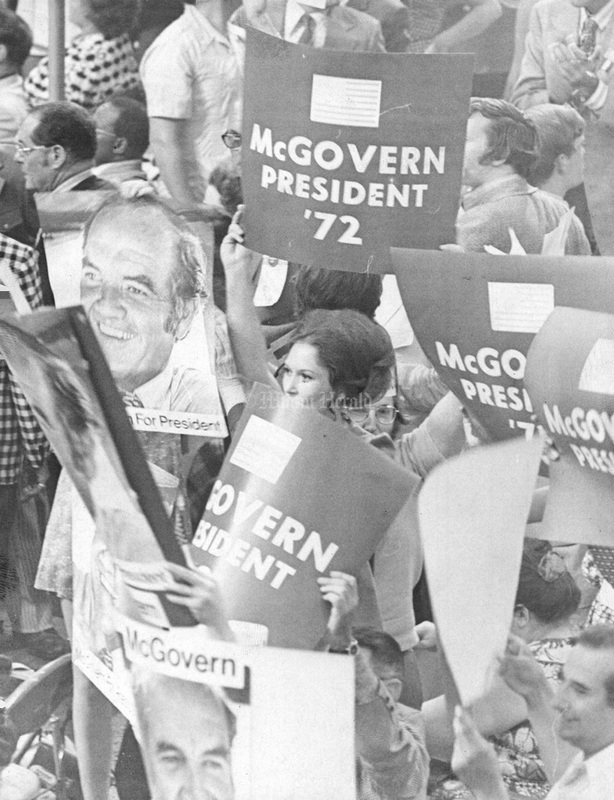 McGovern will get all of the 271 votes in the California bloc. 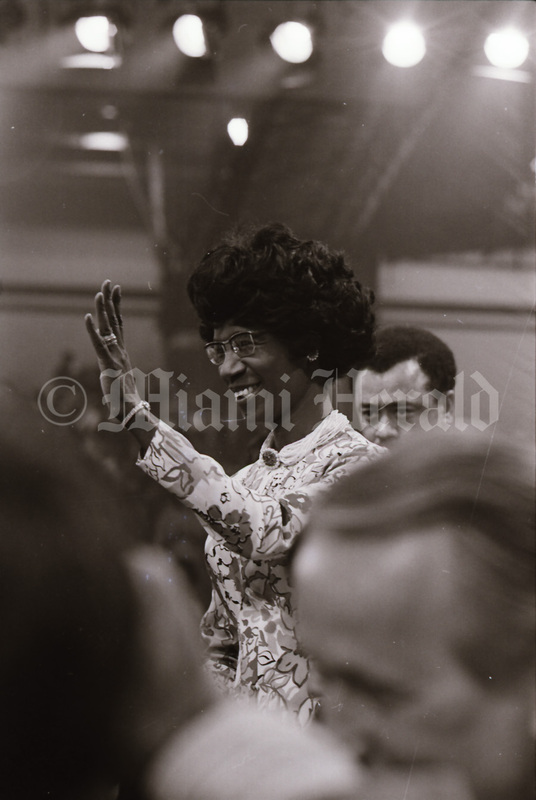 7/1972, Miami Herald Collection, HistoryMiami Museum: Presidential candidate Shirley Chisholm on the floor of the convention. 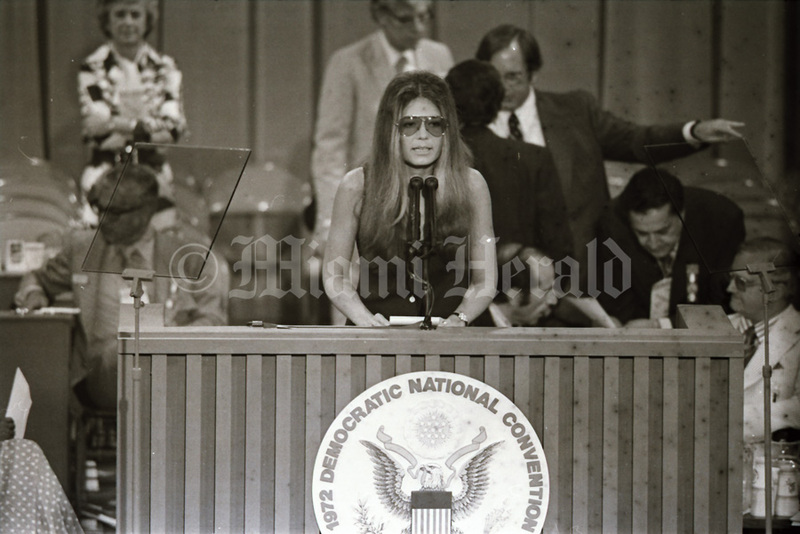 7/1972, Miami Herald Collection, HistoryMiami Museum: Gloria Steinem speaks during national Democratic Convention. 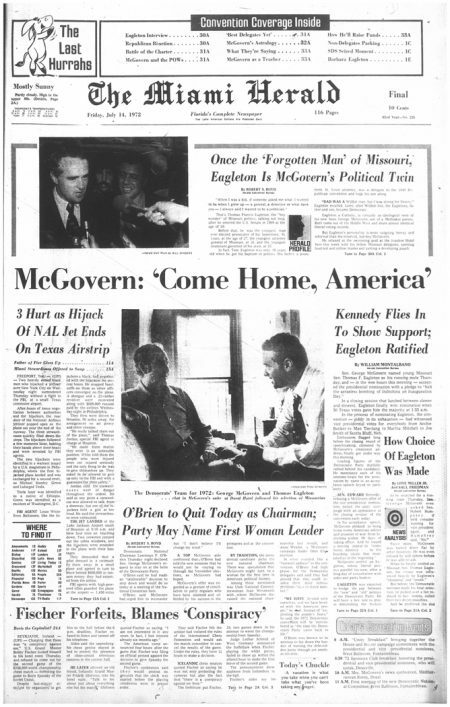 7/11/1972: Wallace Presents His Views--Gov. George C. Wallace of Alabama, speaking from his wheelchair on the podium of the Democratic National Convention, tells the delegates Tuesday night what he thinks they should do about the party platform. 7/12/1972: New Face On The Floor--Susan Malkin of Bergen County, N.J. wears a mask of President Nixon on the floor of Convention Hall during the second session of the Democratic National Convention. 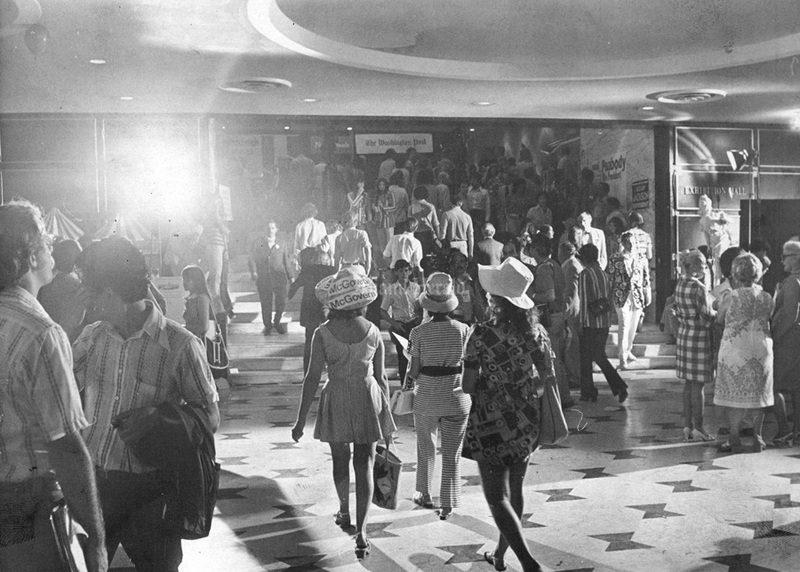 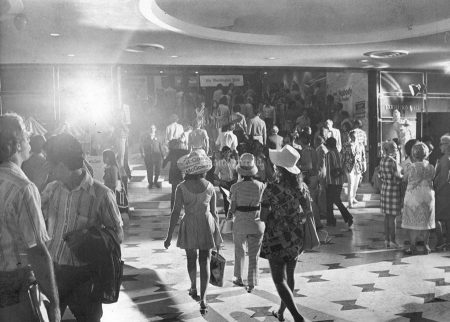 7/1972, Miami Herald Collection, HistoryMiami Museum: floor of the Democratic Convention. 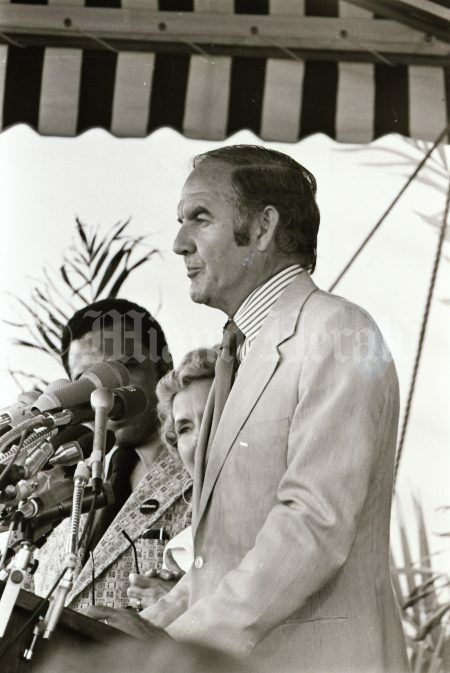 7/1972, Miami Herald Collection, HistoryMiami Museum: Democratic party's Presidential nominee, George McGovern, addresses crowd during the convention. 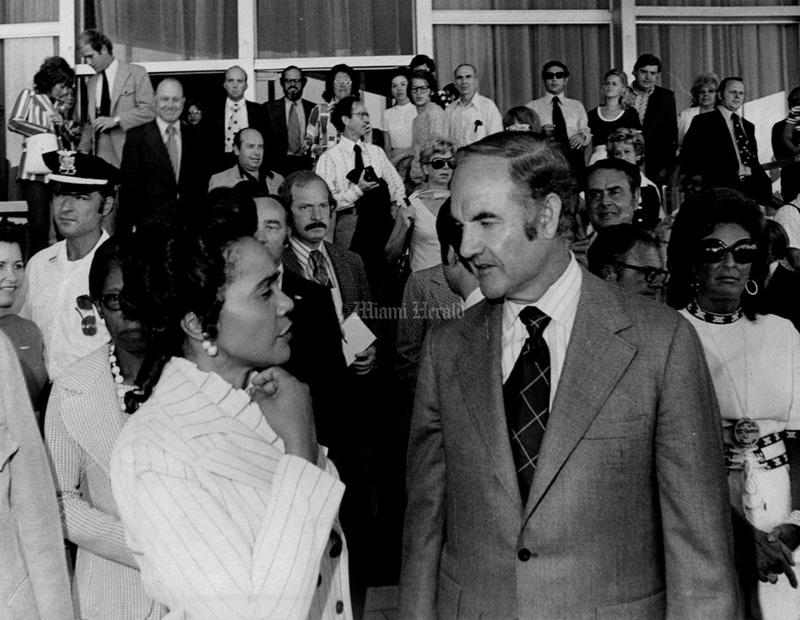 7/14/1972, Battle Vaughan/Miami Herald: Coretta Scott King, wife of Martin Luther King Jr., and George McGovern at door of Deauville hotel. 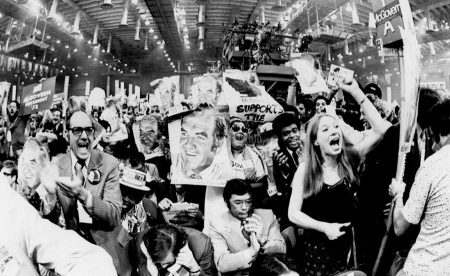 7/12/1972: California's Democratic leaders cluster around their standard on the convention floor and cheer the Illinois vote that gave Sen. George S. McGovern the party’s presidential nomination Wednesday night. 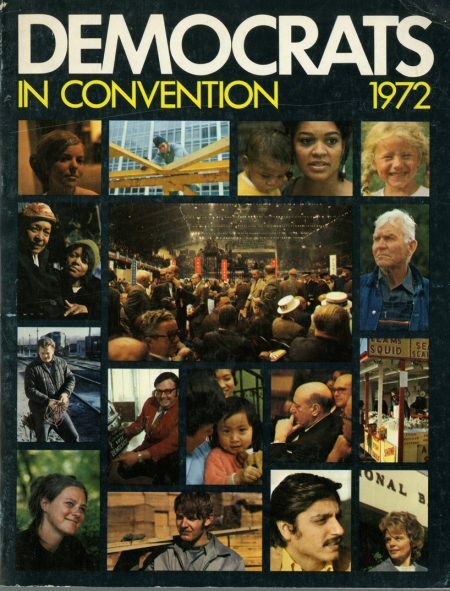 Top left is delegation co-chairman John Burton. 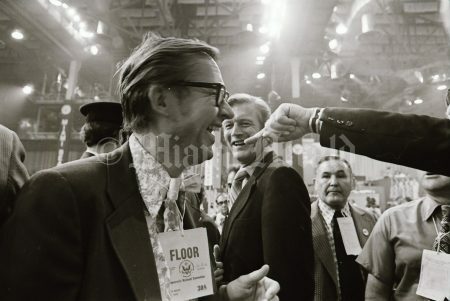 Directly below him is Gary Hart, campaign manager, with Frank Mankiewicz and Willie Brown, Jr., under Bufon’s arm. 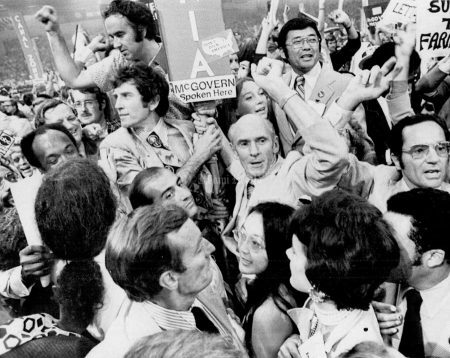 In center, arm upraised, is Sen. Alan Cranston with actress Shirley MacLaine above him. 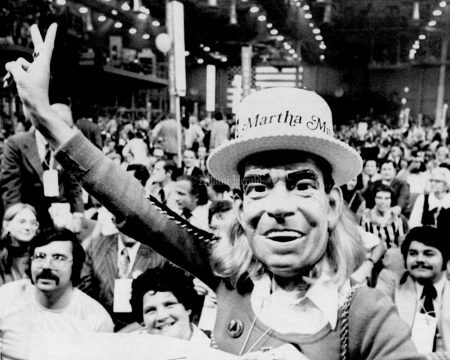 Facing Cranston is Assembly speaker dob Moretti. 7/14/1972, Battle Vaughan/Miami Herald: Democratic Convention, 1972. 7/11/1972: JUBILATION REIGNS AMONG ILLINOIS DELEGATES--These Illinois delegates express their joy over the victory of Sen. George S. McGovern's forces in the crucial challenge on the California delegation to the Democratic National Convention early today. 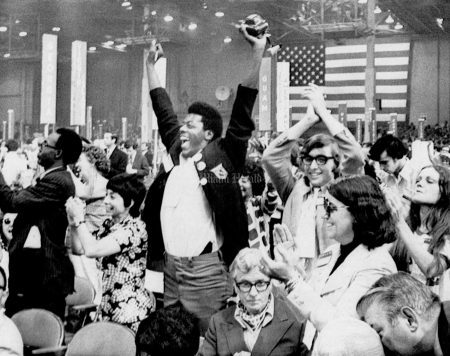 They felt it presaged victory for them in a challenge involving the Illinois delegation. 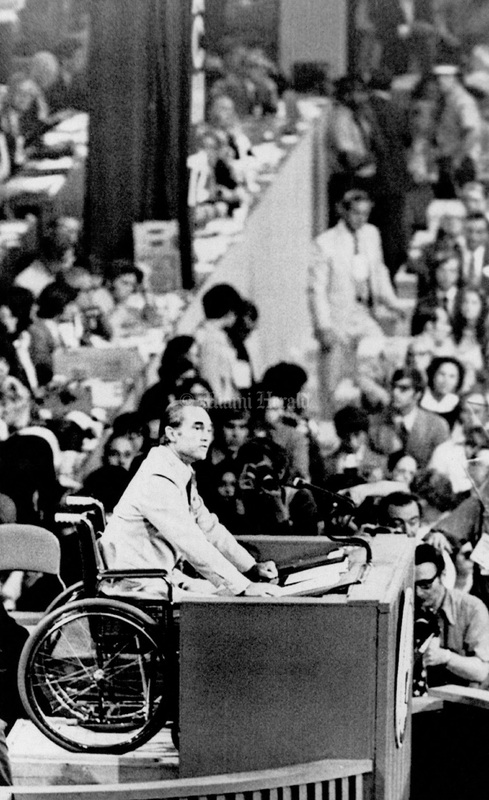 7/1972, Miami Herald Collection, HistoryMiami Museum: Miami Herald reporter, Gene Miller, at the floor of the Democratic convention. 7/1972, Miami Herald Collection, HistoryMiami Museum: Marlo Thomas at the floor of the convention. 7/12/1972: After The Tumult And The Shouting--Discarded placards litter the floor of Miami Beach's Convention Hall after Democratic delegates at their National Convention nominated Sen. George S. McGovern to be their presidential candidate Wednesday night. 7/1972, Miami Herald Collection, HistoryMiami Museum: Activists at "Resurrection City II" in Flamingo Park during the 1972 Democratic Convention. 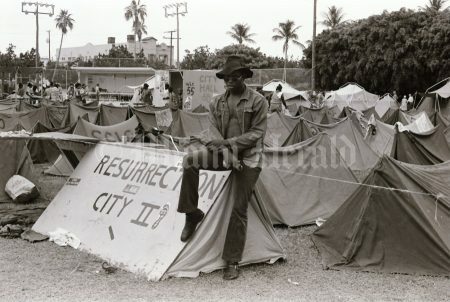 Named after the "Resurrection City" settlement constructed in May 1968 at the nation's capital during the organized Poor People's Campaign march on Washington, D.C. to bring attention to the plight of the country's impoverished.